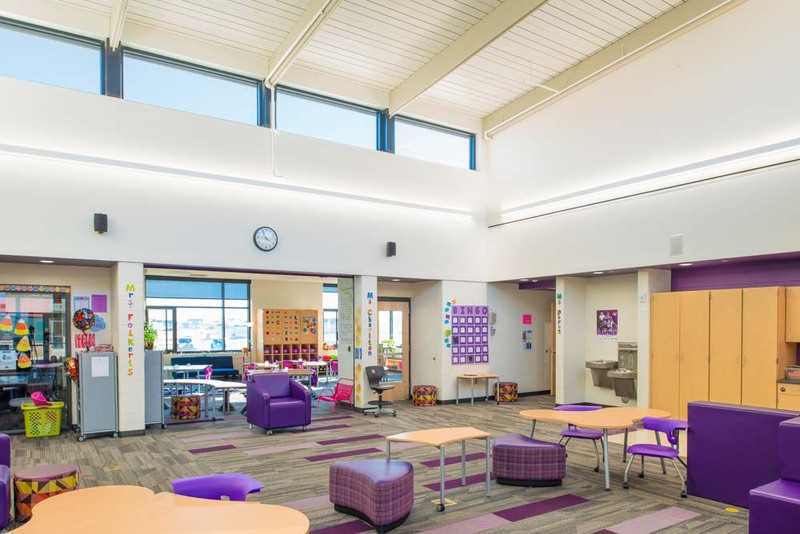 Aldrich Elementary school is a brand new school to accommodate the rapidly growing enrollment of the Cedar Falls Community School District. 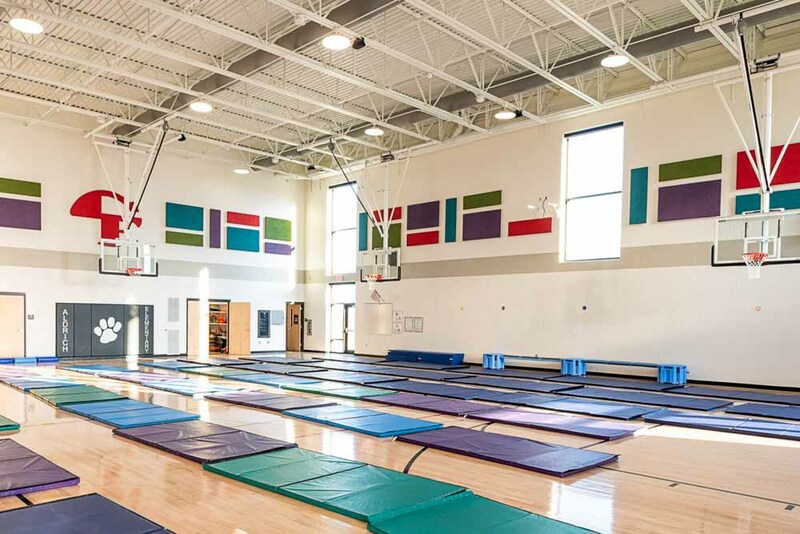 ISG Architects (formerly Struxture Architects) teamed with Fielding Nair International in the Schematic Design portion of the project to bring a modern, cutting-edge elementary school design to enhance student experience as well as to provide a community center to hold various events. The two main classroom wings boast three classrooms, a commons space and a “Da Vinci” Studio for each grade level spanning first through sixth. Kindergarten and Pre-K are located in a separate wing of the building and are accompanied by Preschool with the use of a large commons space as well. 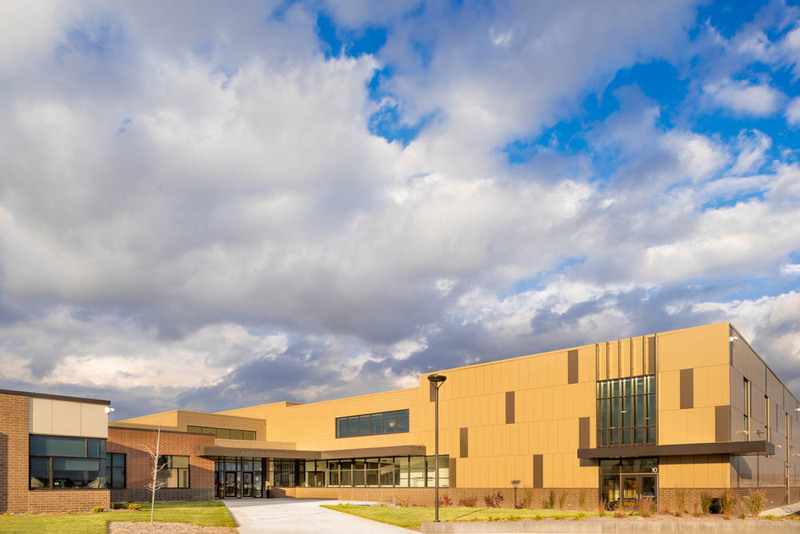 MODUS has designed multiple geothermal projects for Cedar Falls CSD in the past so this project was a great candidate to incorporate a geothermal HVAC system into its design. The mechanical system consists of a geothermal pump and reinject system with high efficiency heat pumps throughout, energy recovery ventilators (ERVs) to provide fresh air ventilation to each space, variable frequency drives (VFDs) for the building and well pumps, radiant floor in the entryways and in the Pre-K/K classrooms near the exterior walls, and an energy-efficient controls scheme via the direct digital controls system. 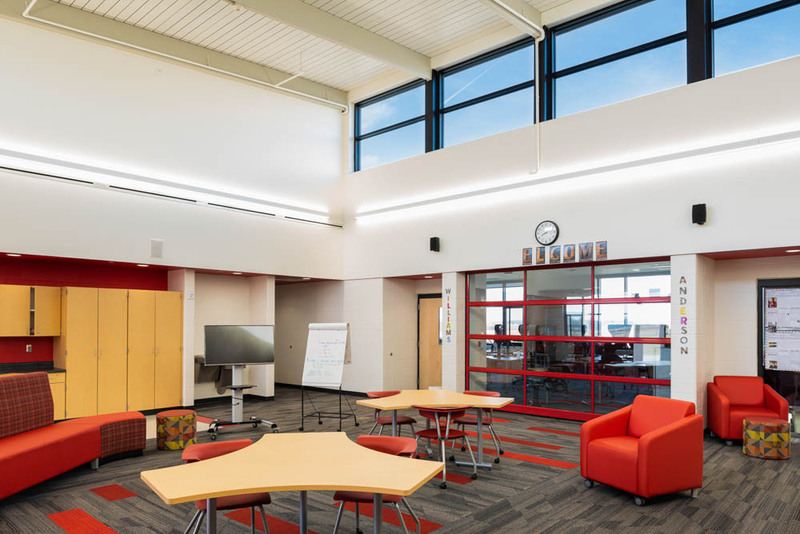 The school was designed with an abundance of glass to provide daylight to the classrooms, commons spaces, and administration offices which allowed MODUS to incorporate multiple daylighting zones to further reduce the already low energy usage from the LED lighting system. An empty conduit in the Makerspace to the exterior was planned to install a future, small solar panel array for the children to learn about and experiment with sustainable energy production. The school also features the latest in classroom and collaboration technology at the elementary school level. Short-throw projectors mounted above the markerboards create an interactive learning environment in each classroom space. The commons areas encourage collaboration with technology connections located in floor boxes throughout the space for individual or group assignments but can be easily converted into a classroom setting by a simple push of a button at the teacher’s station to allow all of the individual screens to share the same content. 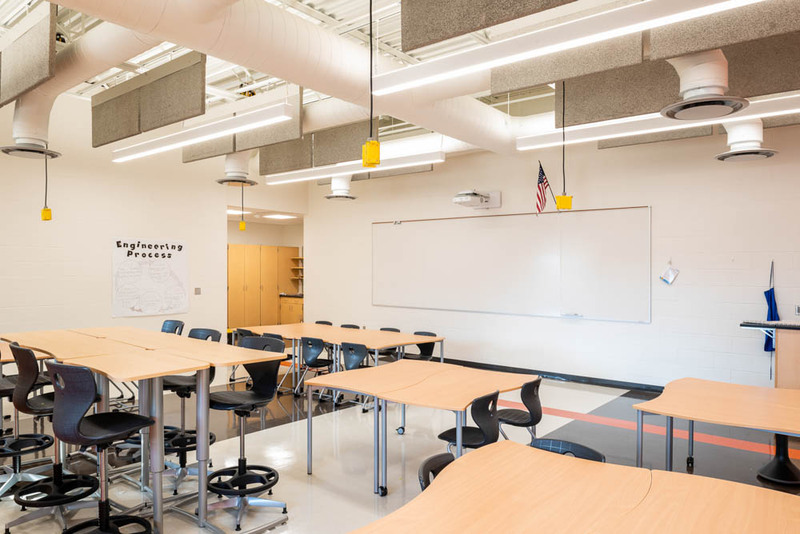 Enhanced classroom amplification was incorporated in all classrooms throughout the building to accommodate any specific learning needs the teachers may encounter. 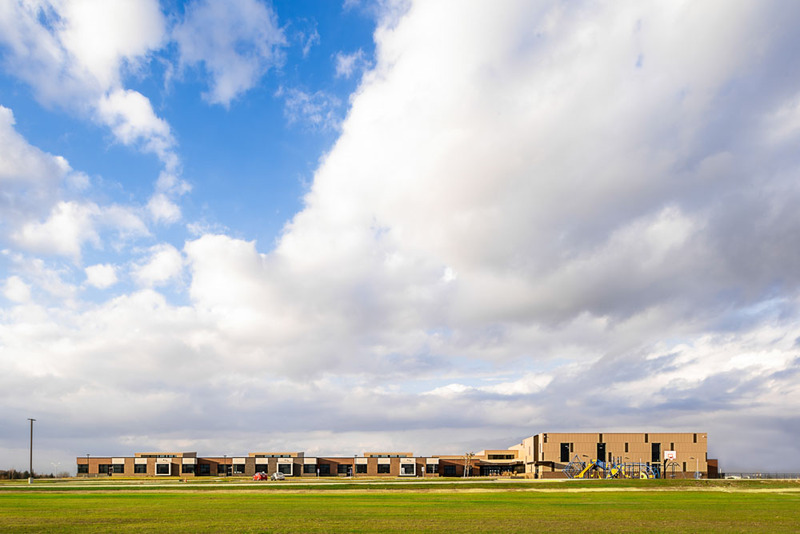 Safety in all schools is paramount, so the new school included door access security located at the points of entry and features a lockdown scheme to prevent intruders from gaining access to the main lobby or classroom wings. The school also uses enhanced quality security cameras to monitor all access points to the building as well as the parking lots.